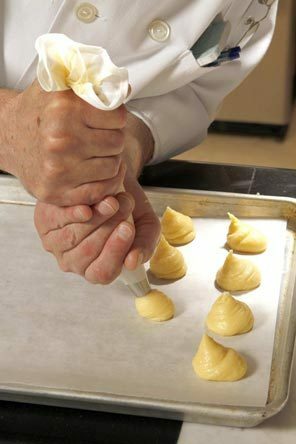 Geraldine’s Gougères are fairly simple to make. However, you will have much better luck if you use a baker’s scale to measure the ingredients exactly as listed. In a saucepan, melt the butter with the water and the salt, mixing with a wooden spoon until the butter is just melted. When it begins to boil, add the flour all at once and mix well. When cool, add the eggs one-by-one, mixing energetically each time. Add the cheese cubes, fresh herbs, bacaon (if using) and mix well. 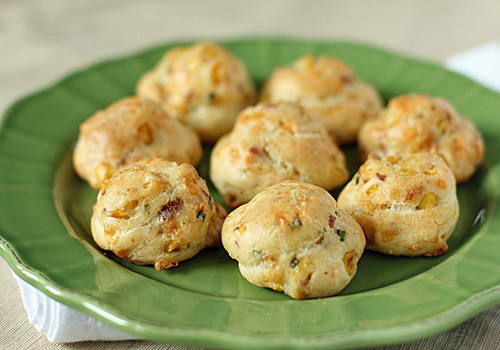 Serve as an appetizer or as an accompaniment to soup or salad. Profitez!